What comes to mind when you think about carnivorous plants? Perhaps you think of Seymour from Little Shop of Horrors, or if you are like me, you think of how you killed multiple Venus flytraps as a kid. Chances are, you think about plants that are nearly impossible to keep alive in your own home; however, if you choose the right plants and you are armed with the correct knowledge, you can grow a variety of these fascinating plants in your home or garden. They require care that is a little different than the average houseplant, but growing such awesome plants is well worth the patience required. Although carnivorous plants can be very different and have different requirements, they all have some basic things in common; they capture and kill insects and other small creatures using specialized leaves that function as traps, and they get needed nutrients from their prey. Carnivorous plants grow in soils that are low in nutrients that the plants need to survive, especially nitrogen. This is why when you grow carnivorous plants, you need to use a special carnivorous plant mix or mix your own; one good recipe for the plants below is one part milled peat to one part silica sand. Only butterworts require something different. You should not use tap water on these plants or the total dissolved solids in the water and the chemicals (which these plants are not accustomed to) will build up and kill your plant. Carnivorous plants will need to be repotted every year with a complete change of soil, and most do not require fertilizers, although you can feed them insects. The first time I saw a tropical pitcher plant, I was in love. These plants form hanging vases that come in shades of green, red, and purple and can have streaks or splotches of red or purple. Some grow large enough to trap mice and rats, although the pitcher shapes and size depends on the plant. Some of these plants can be grown indoors in a sunny windowsill, although they appreciate a vacation outside in a shady or partly shady location. Tropical pitcher plants tolerate hard water better than most carnivorous plants, but I usually water mine with rain water to be on the safe side. The soil should always be moist, but the plants should not be left standing in water. 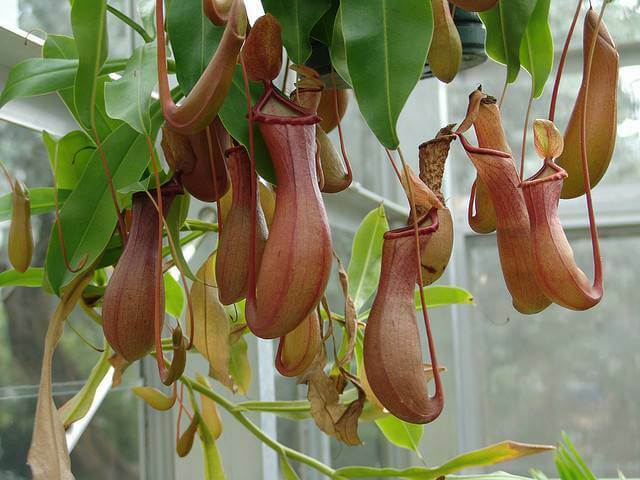 Some easy tropical pitcher plants to grow in the home are Nepenthes alata, Nepenthes sanguinea, and Nepenthes truncata. I think all of us have seen Venus flytraps for sale at the grocery store or garden center. These little monsters are native to the bogs and swamplands of North and South Carolina. They need a lot of sunlight, so growing them outdoors in full sun is the best option; if this is not possible, grow them in the sunniest location you have or use artificial lights no more than eight inches away from the plant. Like the North American pitcher plant, Venus flytraps require a dormant period, and without it, they will eventually die. Never use tap water for Venus flytraps, as the salts, calcium, chlorine, and sulfur in the tap water will build up and kill the plant. The substrate should never be allowed to dry out but should not be waterlogged. Venus flytraps do great in plain white Styrofoam cups, which provide insulation but do not absorb heat and are the perfect shape and depth for them. Butterworts are not as popular as other carnivorous plants, so don’t feel bad if you’ve never heard of them. 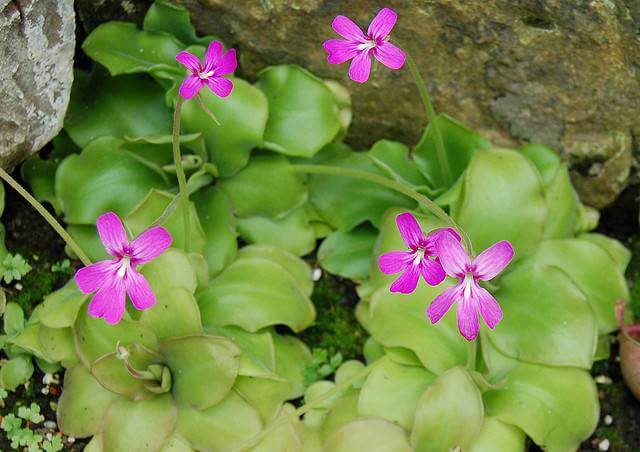 These small plants are formed with rosettes of greasy leaves, thus the common name butterwort; in fact, even the Latin name Pinguicula translates into “the little greasy.” They have beautiful delicate flowers that can be white, pink, purple, yellow, or red. The buttery appearance of the leaves is due to greasy glandular hairs that attract and capture fungus gnats. There are both tropical and temperate butterworts, so some go through a dormant period and some do not. Most butterworts grow well in a sunny window. Unlike other carnivorous plants, they do better with a more alkaline soil mix, and there are many recipes for these; one is ground bark with no fertilizer and perlite. Watering and care requirements depend on the type of butterwort. Sundews are found all over the world and can be tropical or temperate. They are small plants with leaves that act like fly paper, trapping unsuspecting insects with little hairs with dewdrops that appears to be nectar but are actually digestive enzymes. The insects stick there and are slowly digested until they are nothing but dried shells that blow away. 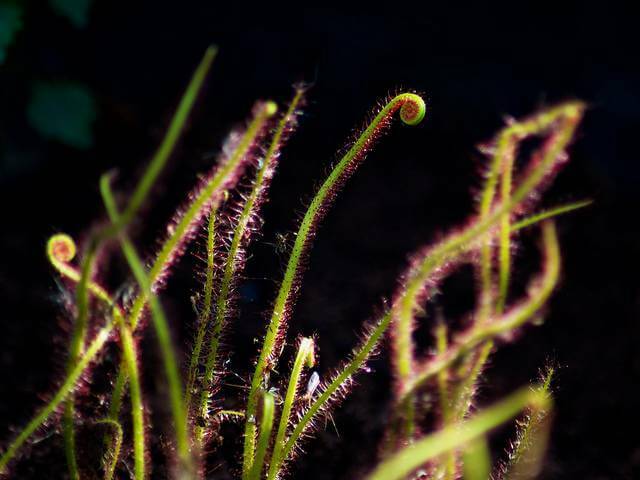 In some sundews, the strap-like leaves will curl around the insects. Sundews come in many forms, from weedy looking plants with green strap-like leaves to tiny plants with rounded red leaves. Sundews require lots of bright light, so growing them outside, on bright windowsills, or under artificial lights is best. Water them with rainwater, reverse osmosis water, or distilled water until moist or waterlogged; care depends on the type. The cape sundew is one that is easy to grow and great for beginners.